Here on WGC we’re all about balance. Between salads, brownies, pasta and everything else covering the pages of my blog – I think it’s obvious that balance is key! That said…I love a risotto moment! 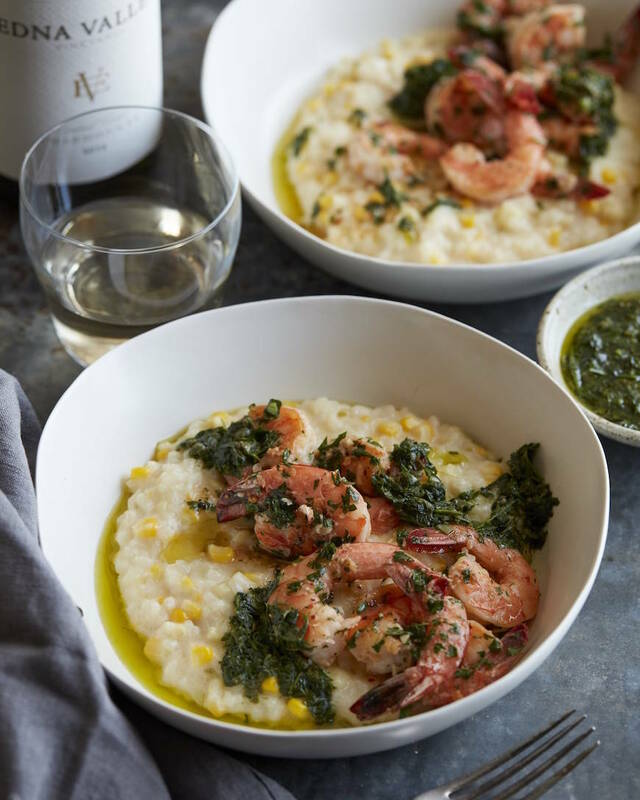 Summer Corn Risotto with Shrimp & and a cold glass of Chardonnay or two is the PERFECT way to bring a group of friends together this summer for a gorgeous al fresco meal. 🙂 It sounds decadent but it’s super do-able! Promise! Some people are intimidated by risotto – but guess what – it’s totally not that hard. It just requires a tiny bit of attention, some cheese and some really delicious wine (to cook with and to enjoy with the meal!) The wine is such a big part of this risotto because it infuses the dish with all sorts of flavor – so it’s really important to use a great wine that you’d actually want to serve your guests! 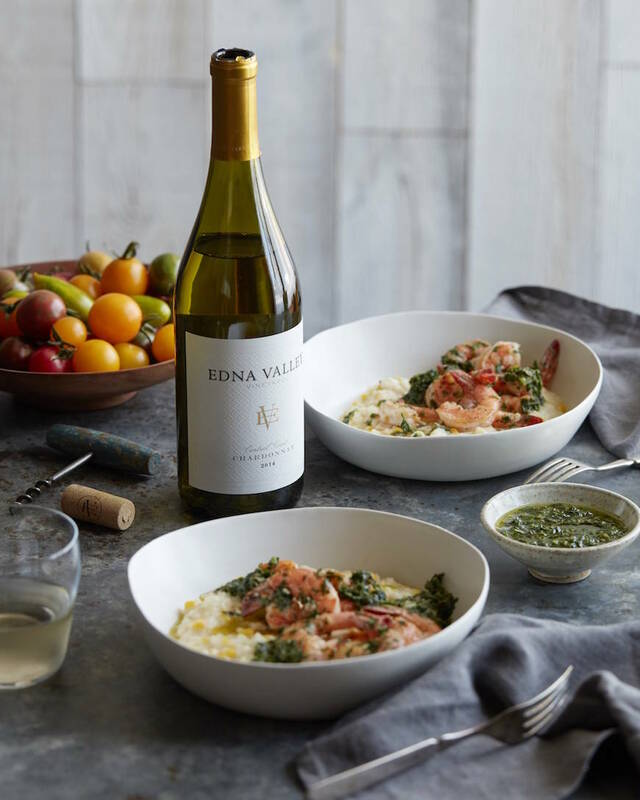 We’re going with Edna Valley Vineyard Chardonnay because its subtle layers of peach and apricot with notes of pineapple and brown spice are the perfect complement to fresh summer corn and the 2 kinds of cheese that the recipe calls for! It’s next level – you won’t be disappointed! Okay are you ready to dive head first! We have 3 parts of this dish – none of which should scare you! First – let’s talk risotto! Risotto is just a special kind of rice (you can find it at just about every grocery store ever) that you cook slowly with small additions of liquid every few minutes. First the liquid comes in the form of wine, and then you can use chicken stock, or vegetable stock! Or you could even use water! Easy right? Just cook it until it’s tender and then you get to mix in whatever you want. In this case it’s corn, cut fresh off the cob, but you could also do sautéed greens, roasted mushrooms, charred peas… the sky’s the limit! We could stop there, but why?? More is more! 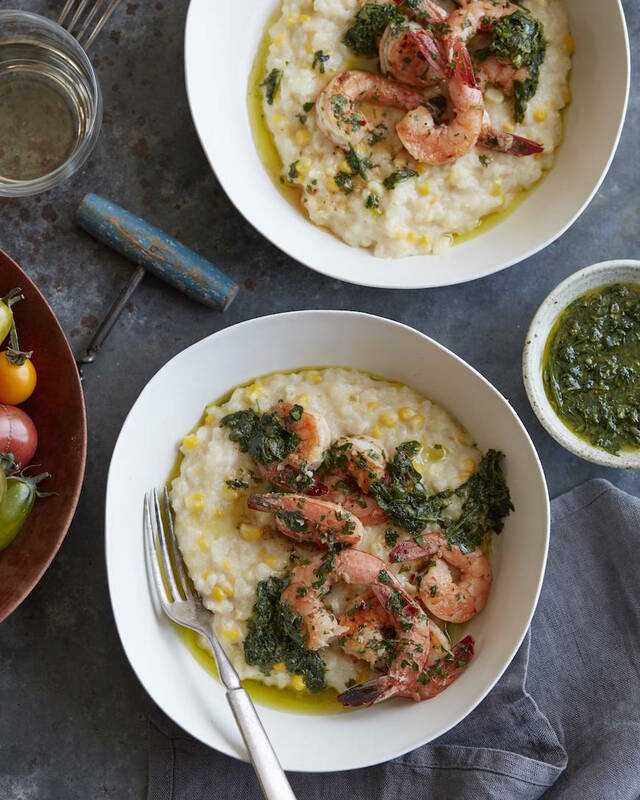 Salsa Verde comes next and it’s basically a spin on a pesto that just gets dolloped on top of the risotto and gives it a pop of corn and a burst of fresh herbs when you get the perfect bite! And last but certainly not least is some sautéed shrimp. 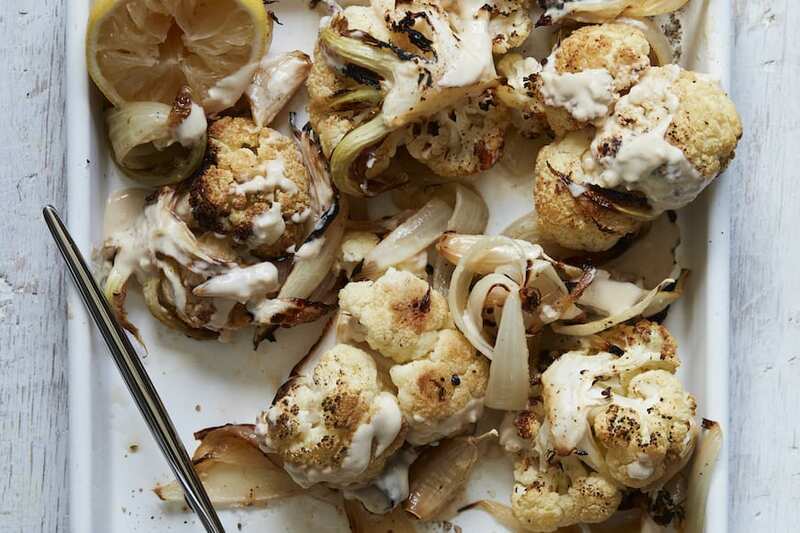 It’s cooked in a butter and olive oil mixture to get the best of both worlds, seasoned with tons of garlic, cooked with a touch of Chardonnay and then finished with some fresh lemon juice and parsley. Ugh, I’m OBSESSED. Put everything together and throw it in a bowl with a glass of wine and call it a dinner party!! Melt 1 tablespoon butter in a wide sauté pan over medium-low heat. Add leek and shallot and cook, stirring occasionally, until softened but not browned, about 6 minutes. Season with salt and pepper. Add rice and cook, stirring, until grains look slightly translucent. Pour in wine and cook, stirring, until it has all been absorbed, about 2 minutes. Add a ½ cup of stock to the rice mixture and cook, stirring constantly, until rice has absorbed all of the stock. Continue cooking, adding cups of stock whenever rice mixture looks dry and stirring continuously. When half the stock has been added, stir in corn. Continue cooking until all of the stock is incorporated, corn is tender and rice is creamy and tender, about 30 to 40 minutes total. Remove risotto from heat and stir in Parmesan and remaining tablespoon of butter. Cover and let stand for 5 minutes. Uncover risotto, stir and season to taste with salt and pepper. Immediately before serving, stir in the mascarpone cheese. 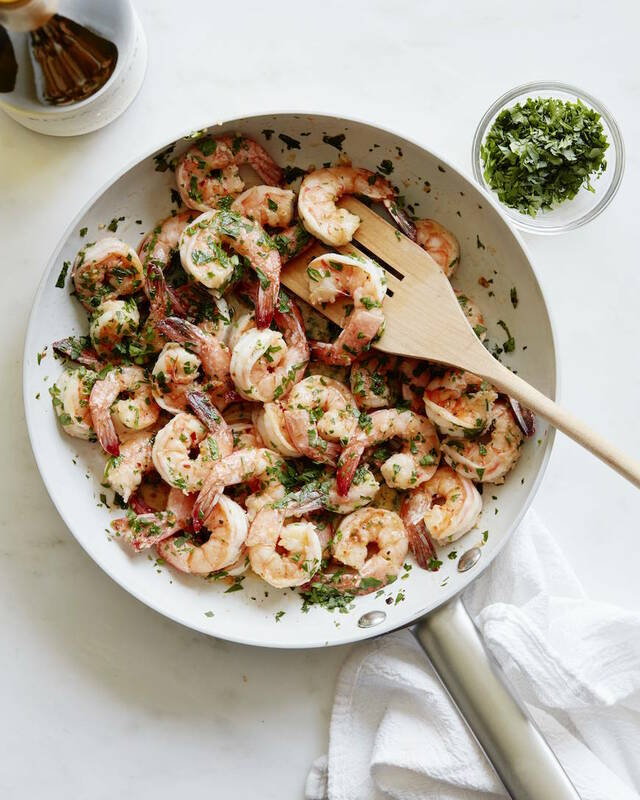 Top with grilled shrimp and a spoonful of salsa verde. In a large skillet, melt butter and olive oil. Add garlic and sauté until fragrant, about 1 minute. Add wine, a pinch of salt, red pepper flakes and plenty of black pepper and bring to a simmer. Let wine cook down for about 2 minutes. Shrimp, corn and butter? Yum!!! How many people does this recipe serve? Thank you. STOP!! This looks so good! I NEED it! Yum! The stock you put in the risotto has to be hot, I usually have a pan of simmering stock next to the pan of risotto on the stove as I cook. 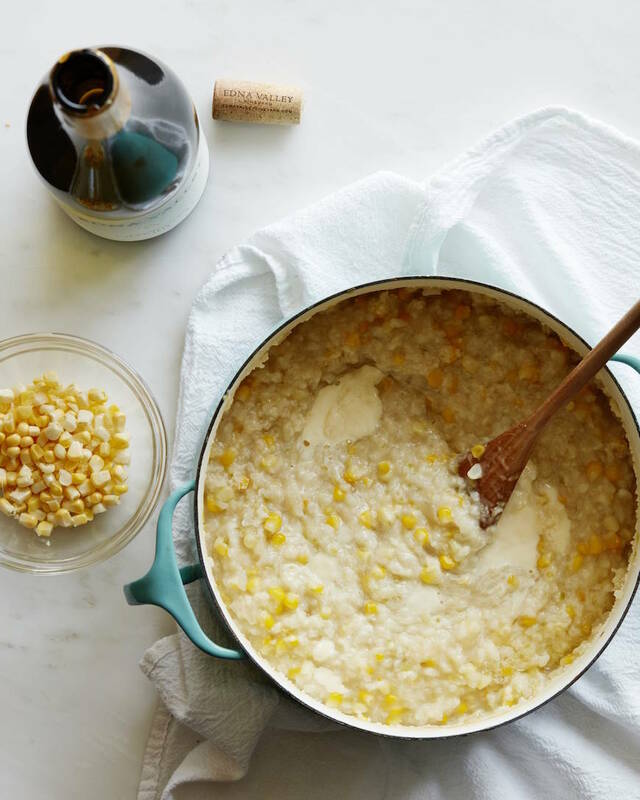 And I love using fresh corn in risotto, seriously yum. And garlic shrimp… mmmm…. I never use hot stock because I’m lazy and I then have an extra pot to wash!! You could do it either way, but it works for me when it’s cold or at room temp just fine! Everything about this looks over the top delicious, and now I am pining for a cold glass of wine too! This looks like a good balance meal to me! I am loving sweet corn everything right now! Nice! Made this last night. Delicious! Several steps but totally worth it. Put sautéed andouille chicken sausage on it for one non-shrimp eater. Fantastic all around. Hubby commented “it’s complex tasting, restaurant worthy.” Will definitely make again! omg yay!! THANK YOU FOR SHARING!! I love everything about this! Can’t wait to dive in. I basically obsess over ANYTHING with shrimp! I’ve never made risotto, but this makes me NEED to change that! GORG meal! I am all about shrimp this summer and this looks amazing! Made this last night, it is SO good! 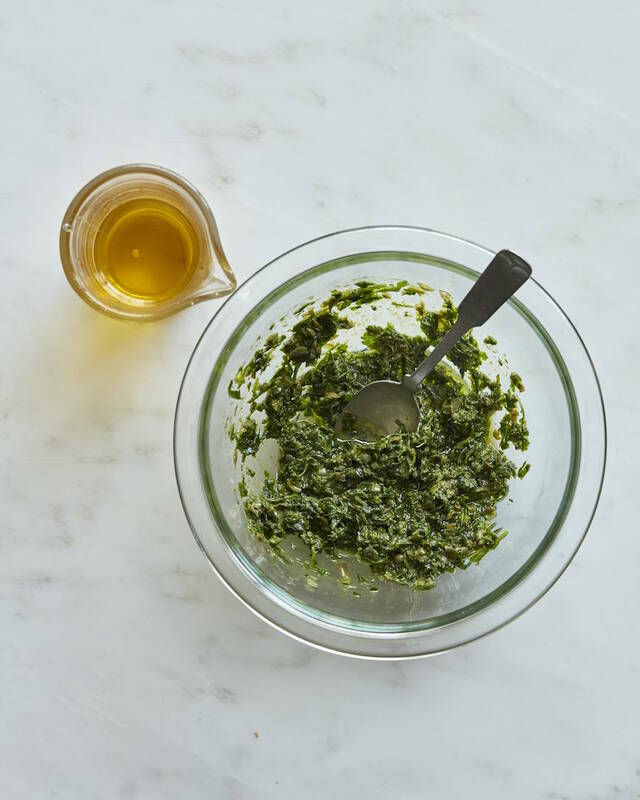 The salsa verde is actually amazing and could be used on any protein. It took me a long time (have never made risotto before) but it was totally worth it. I just had some of the leftover for lunch and it’s still so good. Thanks Gaby! 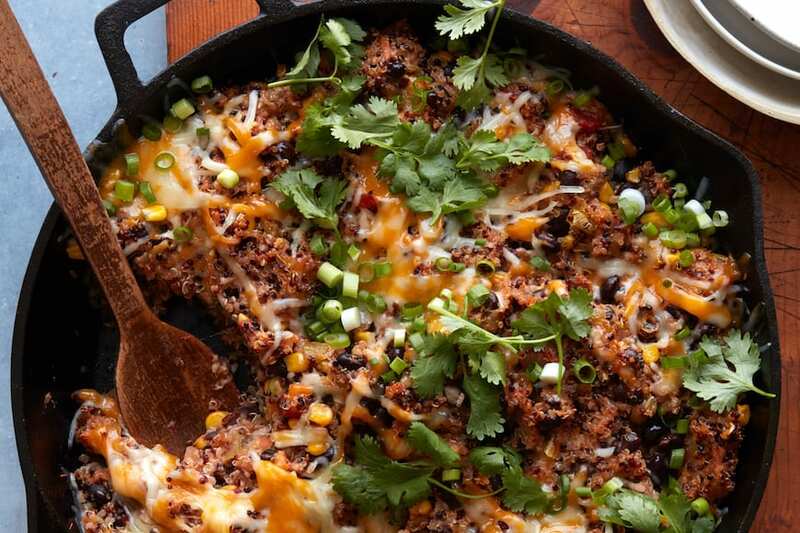 I love everything about this recipe!! 3 of my favorite things all in one dish! Ahh this is the ultimate summer recipe!! Love all these flavors! This looks amazing, Gaby and those shrimp are cooked to magical perfection. I’d love to tuck into a bowl of this with a nice glass of that chard! Yum. We are absolutely obsessed with Risotto and this one… holy YUM, Gaby! Can’t wait to give this one a try! Can I please come over for dinner? 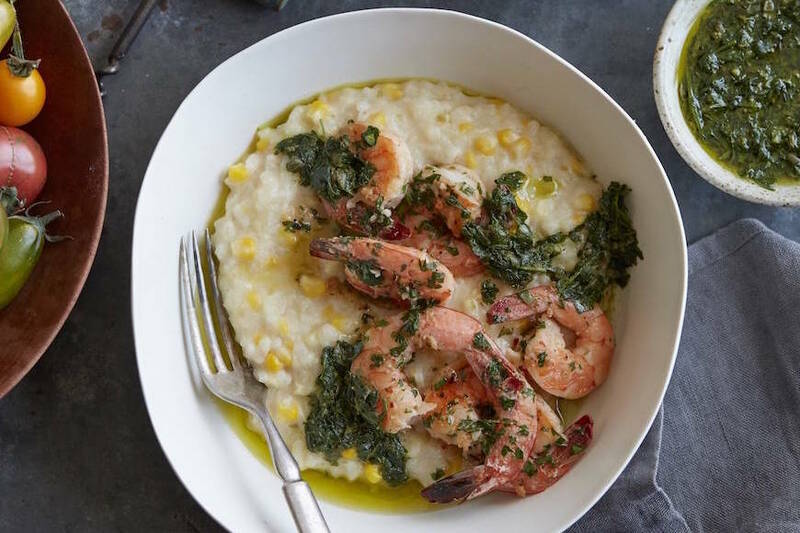 This looks sensational and I love the idea of pairing summer corn with shrimp! 30-40 minutes was wellllll short of how long it took to absorb the stock…think at least double that time. 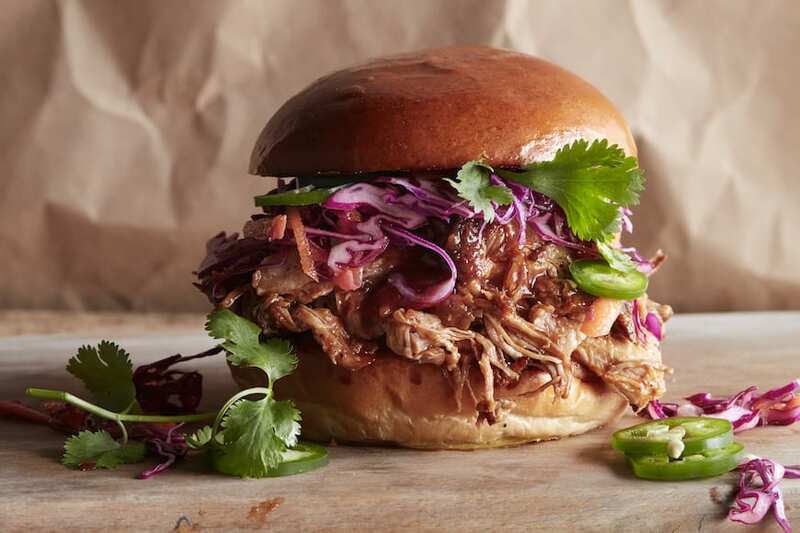 Completely worth it, but prepare so you’re not eating at midnight. Although if you have enough Chardonnay is that really a problem? I can’t wait to make this tomorrow!!! Can I use shrimp that are already cooked though or is it super important to buy raw? How would that change the recipe? Thank you! I prefer them raw since I can infuse more flavor!! Made it on a whim and yes. It was a hit. LOVE it.